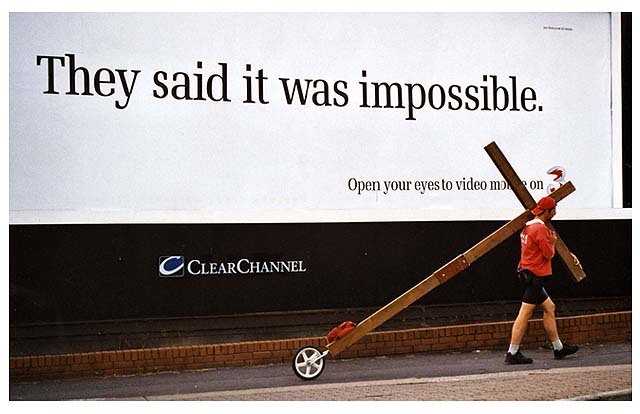 In 2003, evangelist Clive Cornish and photographer Lathan Ball set out from Cardiff to walk 450 miles around the perimeter of Wales. Carrying a large wooden cross the purpose of this walk was to challenge people to think again about the Gospel message. Before leaving home Clive’s family and friends said, “It was impossible”. As Clive and Lathan arrived home four weeks later they passed under a large billboard carrying the advertising slogan “They said it was impossible.” Reminding Clive and Lathan that what is impossible with men is possible with God.